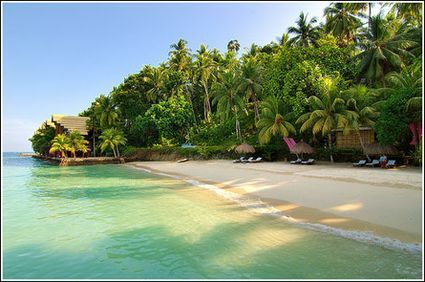 Speaking of the Samal Resort, near Davao, Philippines, "It's beautiful! It's a promising site. It would be like a small version of Sentosa in Singapore once fully developed." Architect Ferrychie B. Cuasito summed up her impression and her vision of the 45 hectare property introduced to the public as Samal Highlands Garden Resort. It is owned by Podador-Alegre-Navarrete and Associates and developed by RJP Realty and Development Corporation which has brought in the planning and architectural expertise of Kintanar, Santamaria, Estalillia, LG&V, and Cuasito and Perez. The recent broker and press presentation of the property development revealed that the site is located at the northern tip of the Island Garden City of Samal particularly in Barangay San Isidro, District of Babak. Just nine kilometers away from the Babak Ferry Terminal, the new Samal Resort property which stretches along a 800-meter beach-line is fronting the big and small Liguid islands. With a project cost pegged at P800 million, the 45-hectare property will undergo a three-phase development particularly named as Emilia Garden Residences, Terazzas de San Isidro and Costa de Azure. The Emilia and the Terazzas will unfold a mix of high-end residential areas at a flat and highland terrain sites while the Costa de Azure will feature leisure, recreational and wellness facilities. Since the residential areas used to be mango and coconut tree plantations, lot buyers would have their share of at least two of the full grown trees, giving ready-made natural shade. Lying below a 30-meter-high cliff at the back of Terazzas de San Isidro area, the Costa de Azure would become a versatile place to enjoy sports activities such as swimming, kayaking, jetskiing, rappelling and taking a zip-line thrill. It would also serve as an educational tour site of students who would like to see and observe the environment of a naturally-grown mangrove area. There will be gazebos, a coffee shop, a convention center, cottages and hotel rooms at Costa de Azure to serve those who want to do business while enjoying the Samal Resort and the beach. One of the property owners, Dr. Jonathan Alegre during the property development presentation rites said the project started with just a dream of having a place to while away the stressful living of city life. But the location his family has found, turned out to be more than just a place to rest but a "God-given" site whose grandeur they want to share with other people. In the same event, co-owner Emilia Podador-Navarette Alegre revealed that the real property development project has been hatched as a tribute to the late Engineer Emilia Lim Podador, who she said, was a visionary and dreamer.